Dylix’s FS Series is designed for the OEM and end user where ruggedness, high performance, and reliability are required at a competitive price. Key feature of the sensing element is its isolation from induced stresses, which maintains negligible zero and span offsets due to the clamping force effects. This product is modular and is configurable to meet our customers exact needs. The FS is built using advanced manufacturing techniques, with automated welding procedures, extreme environmental burn-in and thorough residual stress relieving techniques. The FS Series NEMA 4X packaging ensures reliable service in the wash-down environments of the sanitary industry regardless of signal output or pressure format. Every FS Series sensing diaphragm is “backed-up” with a solid piece of steel which greatly improves the resistance to sharp objects and overpressure. Each transducer is delivered with a NIST traceable calibration certificate. 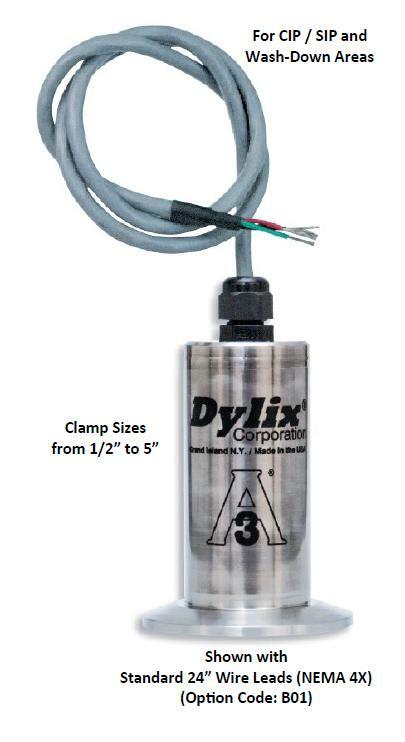 **Dylix Corporation reserves the right to change specifications without prior notification. Please contact the factory for the latest revision.